The rain went stayed away, the volunteers set everything up, the people arrived and a beautiful event was underway last Sunday. 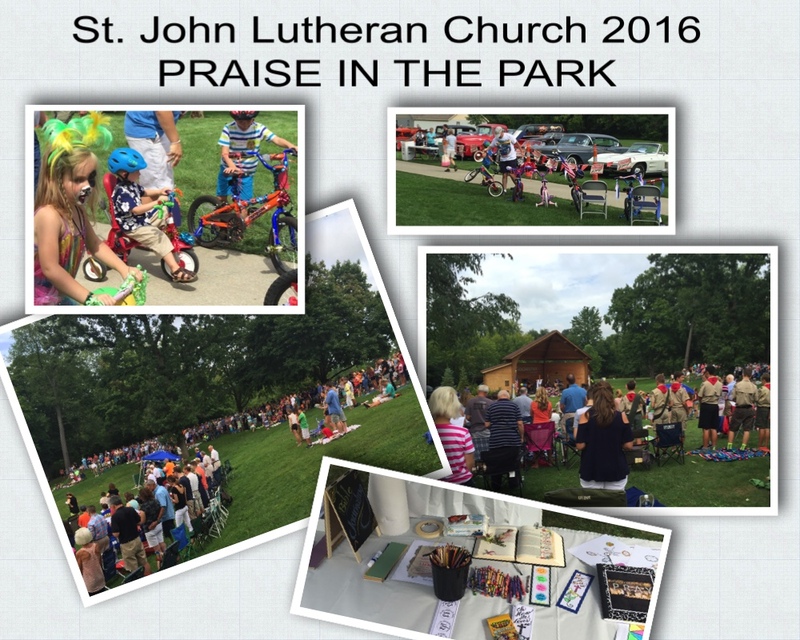 Annually, St. John Lutheran Church here in Rochester, MI hosts a community event in the local park. There were more than 1,000 participants this year! What a glorious (but humid!) day. 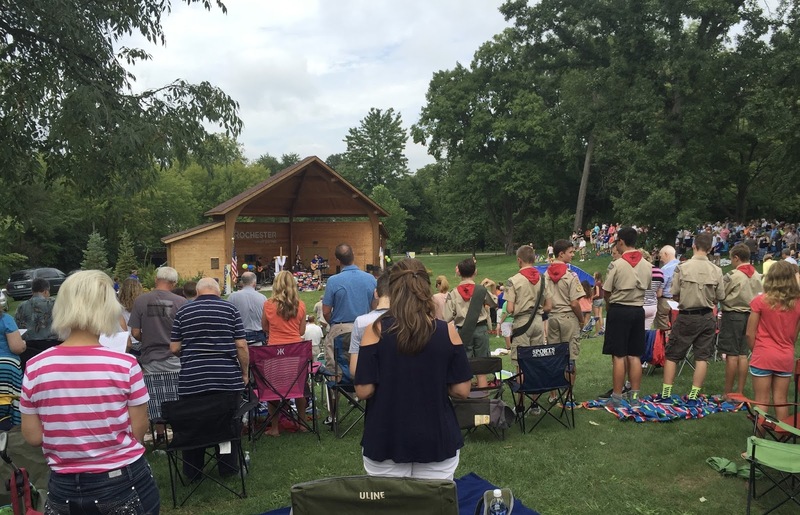 The service is delivered from the pavilion, as guests sit comfortably in chairs or on blankets on the hillside. Since our church has 5 services, this is an opportunity to see some of the friends we miss on a Sunday....For example I DO NOT do early morning very well, so it was nice to see the 8 o'clockers!! <grin> With wonderful music filling the air, a tribute to our cherished veterans and first responders, the whole experience of worship and fellowship was moving and exciting. There were a lot of opportunities to stick around after the service - free picnic lunch of hamburgers, hotdogs, bratwurst and salads, popcorn and ice cream! 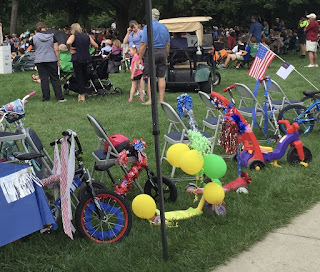 Vintage vehicles were on display as were decorated bicycles. The children brought their bikes so they could participate in the annual parade and perhaps win a prize. This year the cyclists seem to be all decked out as much as their bikes! A wide variety of activities were offered -- face painting, balloon sculptures, photo booth,family games, and health/wellness information. 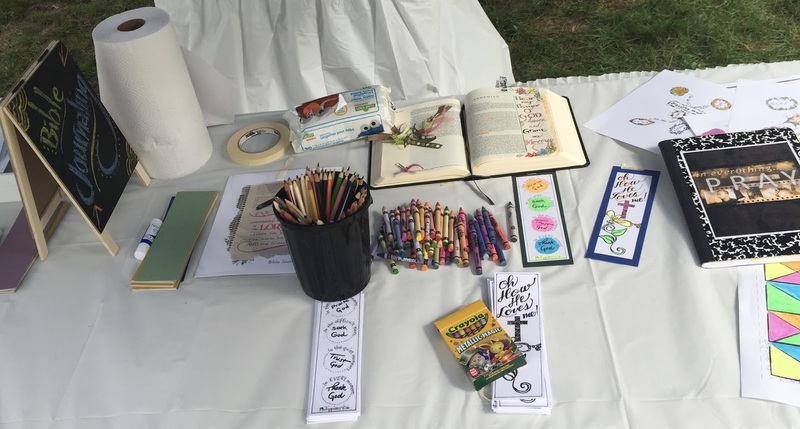 This year a new tent was available to artists to display their work. 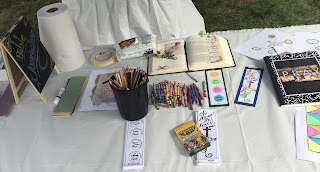 This included a display of Bible Journaling materials and a hands-on opportunity to complete bookmarks which were examples of how to Bible journal. Watercolors or pencils and crayons were used. Praying in Color materials were explained distributed, as well. With donations from local businesses and individuals and the contributions of time and talent of volunteers and staff, this event is a meaningful, joyous community event. 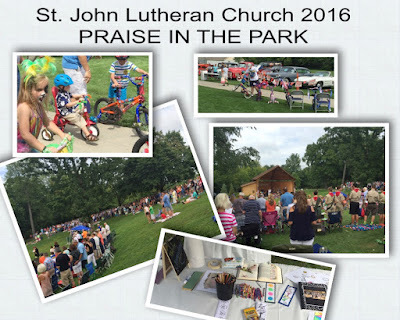 Pastor's message recorded at Praise in the Park is at this link. - Praise in the Park Hope to see you there next year! love seeing the Visual Faith things show up here too!